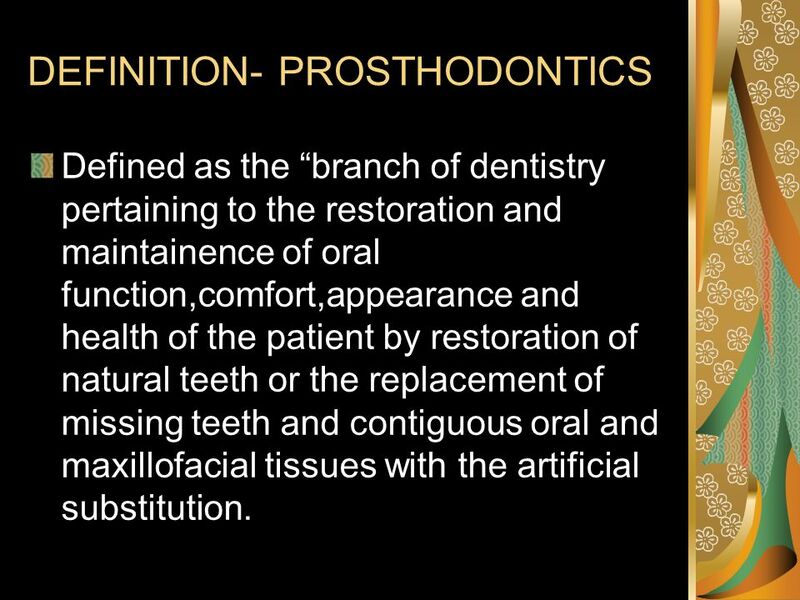 Defined as the “branch of dentistry pertaining to the restoration and maintainence of oral function,comfort,appearance and health of the patient by restoration of natural teeth or the replacement of missing teeth and contiguous oral and maxillofacial tissues with the artificial substitution. 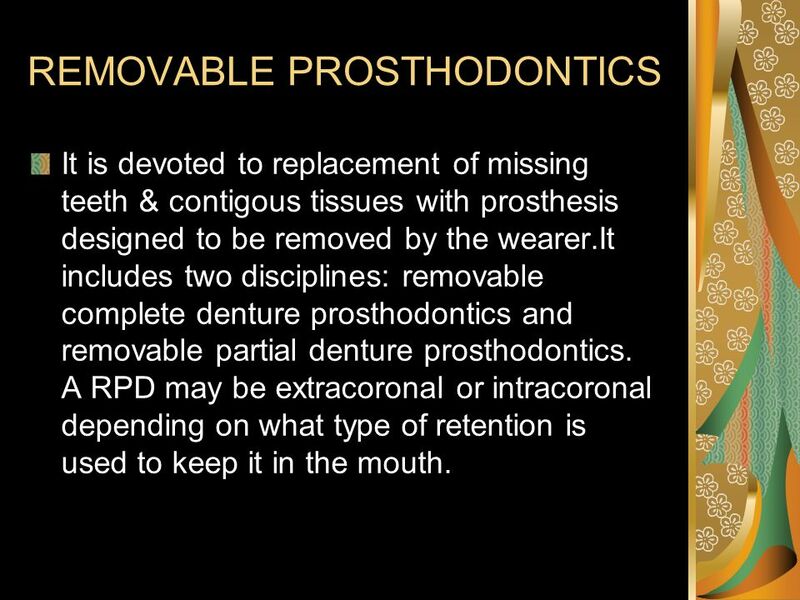 It is devoted to replacement of missing teeth & contigous tissues with prosthesis designed to be removed by the wearer.It includes two disciplines: removable complete denture prosthodontics and removable partial denture prosthodontics. 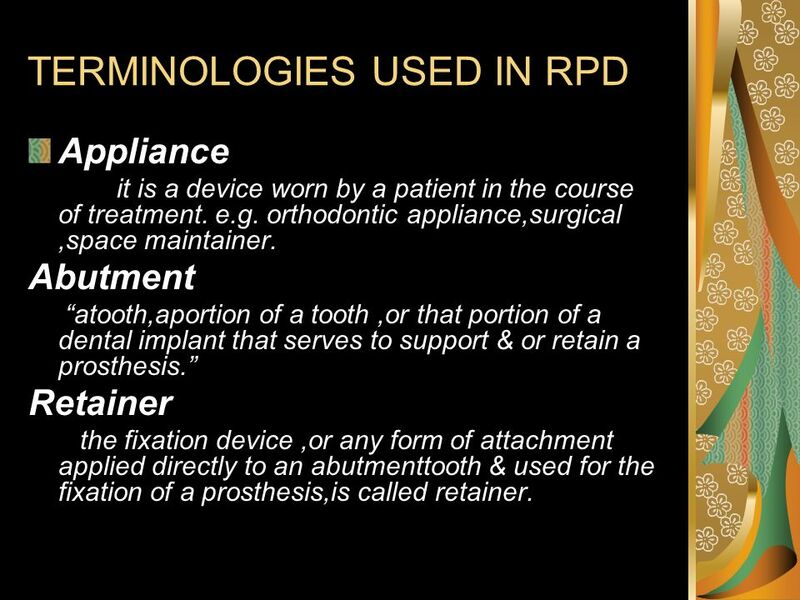 A RPD may be extracoronal or intracoronal depending on what type of retention is used to keep it in the mouth. Appliance it is a device worn by a patient in the course of treatment. e.g. orthodontic appliance,surgical ,space maintainer. Abutment “atooth,aportion of a tooth ,or that portion of a dental implant that serves to support & or retain a prosthesis.” Retainer the fixation device ,or any form of attachment applied directly to an abutmenttooth & used for the fixation of a prosthesis,is called retainer. the retention of this prosthesis depends on the exact parallelism of the two retentive units. 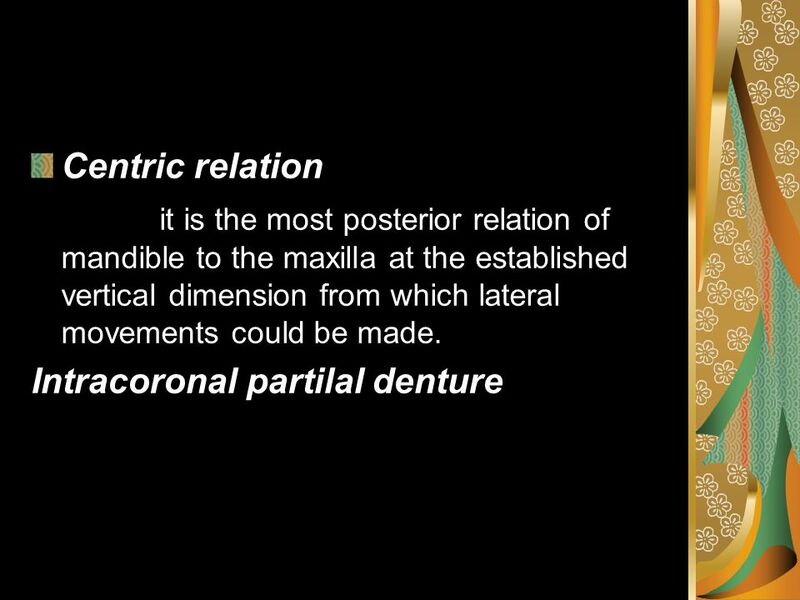 Tooth supported RPD a partial denture that receives support from the natural teeth at each end of the edentulous space or spaces. 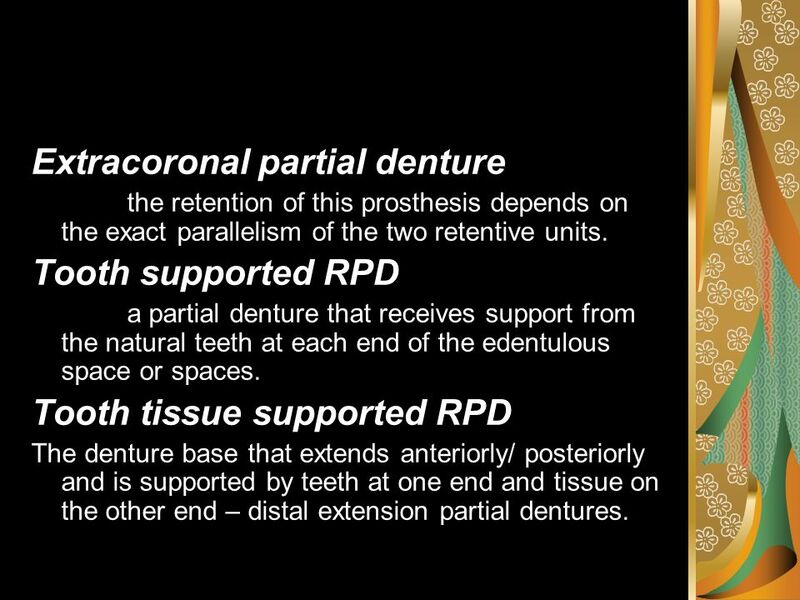 Tooth tissue supported RPD The denture base that extends anteriorly/ posteriorly and is supported by teeth at one end and tissue on the other end – distal extension partial dentures. they are used in patient where tissue changes are expected, where a permanent prosthesis cannot be fabricated till the tissues stabilaize. 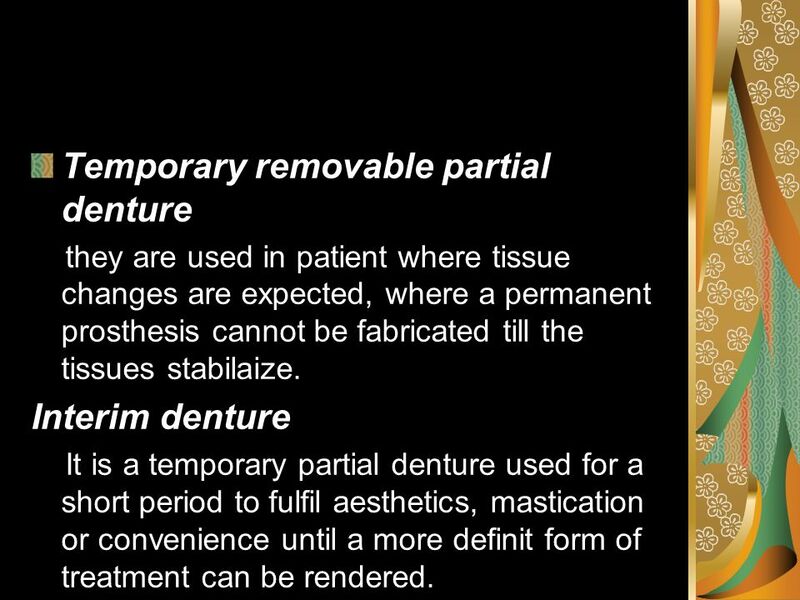 Interim denture It is a temporary partial denture used for a short period to fulfil aesthetics, mastication or convenience until a more definit form of treatment can be rendered. 8 Transitional denture May be used when loss of additional teeth is inevitable but immediate extraction is not advisable or desirable. 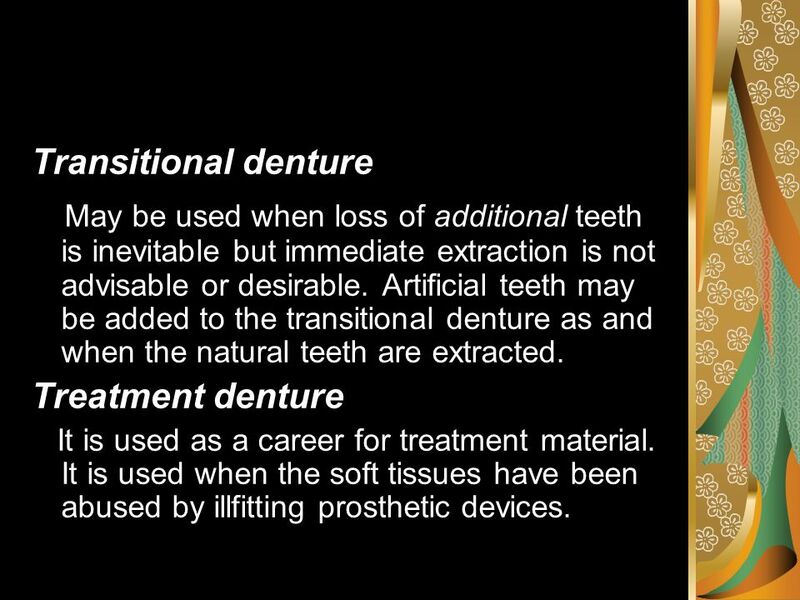 Artificial teeth may be added to the transitional denture as and when the natural teeth are extracted. Treatment denture It is used as a career for treatment material. It is used when the soft tissues have been abused by illfitting prosthetic devices. 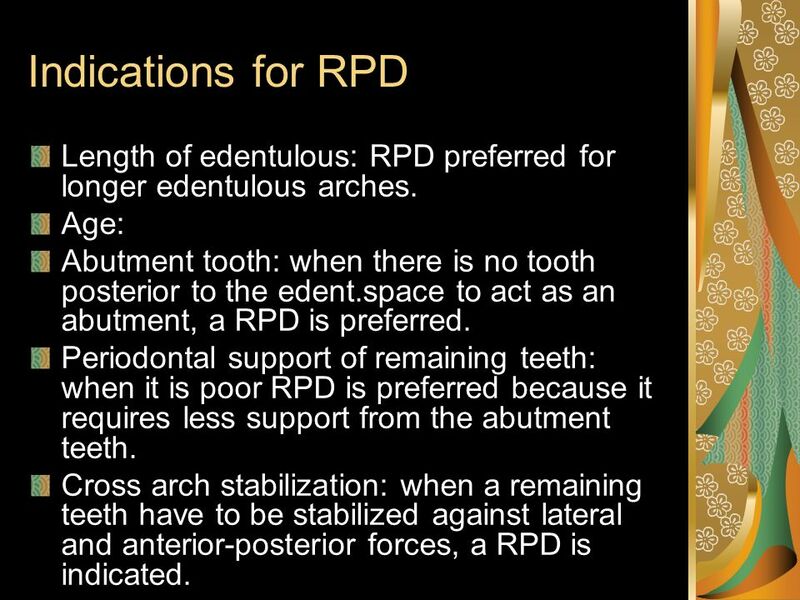 10 Indications for RPD Length of edentulous: RPD preferred for longer edentulous arches. 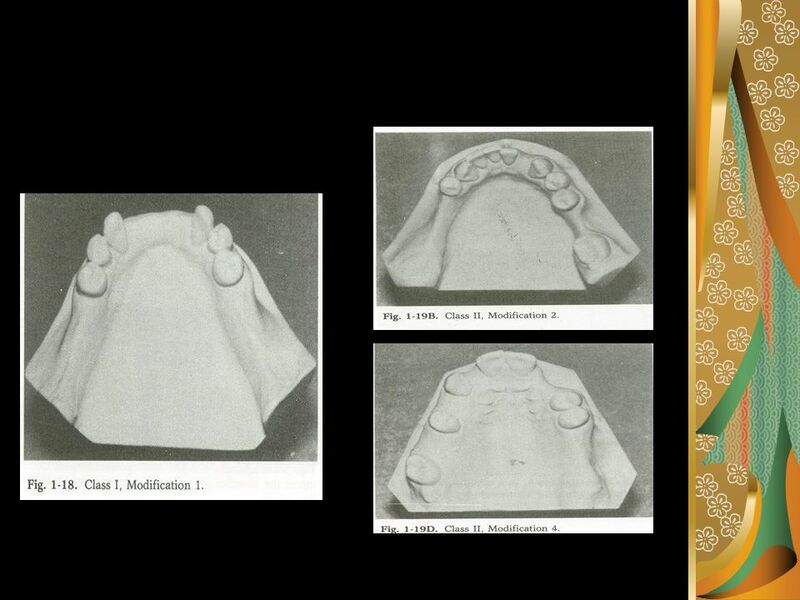 Age: Abutment tooth: when there is no tooth posterior to the edent.space to act as an abutment, a RPD is preferred. Periodontal support of remaining teeth: when it is poor RPD is preferred because it requires less support from the abutment teeth. Cross arch stabilization: when a remaining teeth have to be stabilized against lateral and anterior-posterior forces, a RPD is indicated. When more than 2 posterior teeth or 4 anterior teeth are missing. If the canine & two of its adjacent teeth are missing. When there is no distal abutment tooth. Presence of multiple edent.spaces. 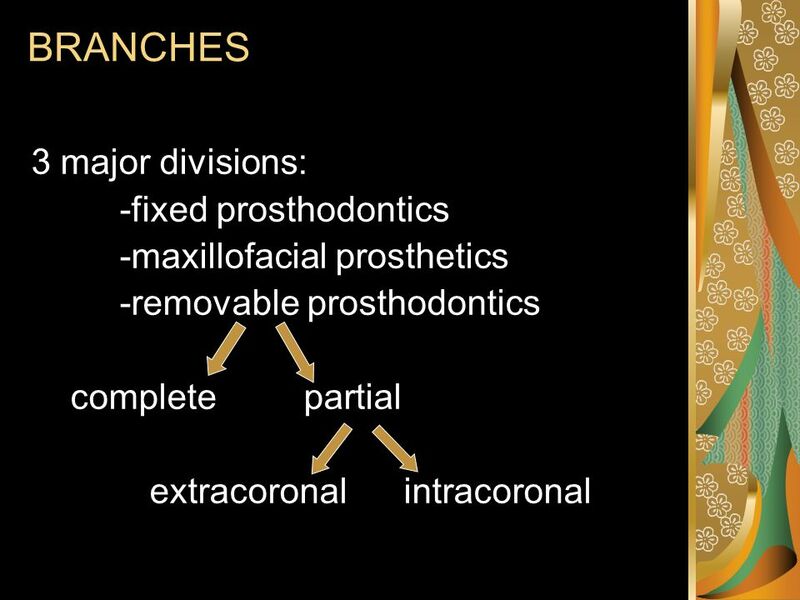 If the teeth adjacent to edent.spaces are tipped ,they cannot be used as an abutment for a fixed prosthesis. 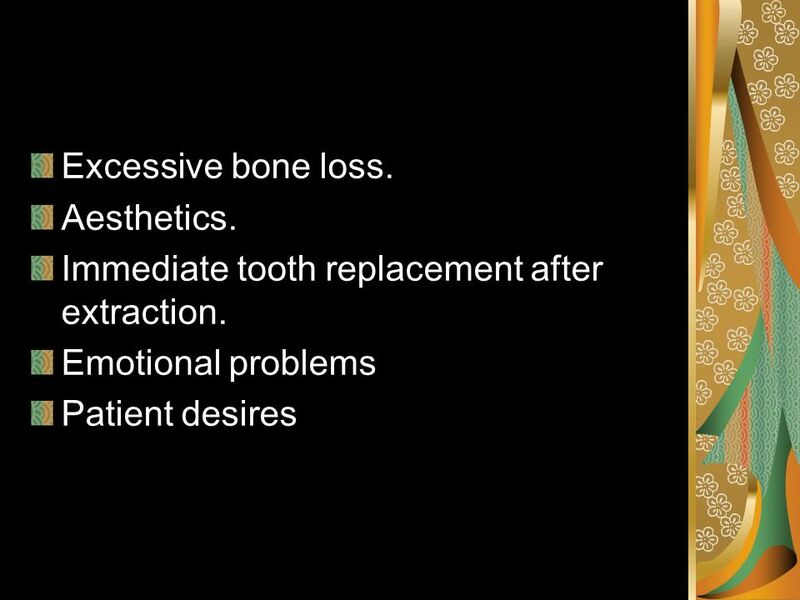 If periodontally weakened teeth are present near the edent.spaces. 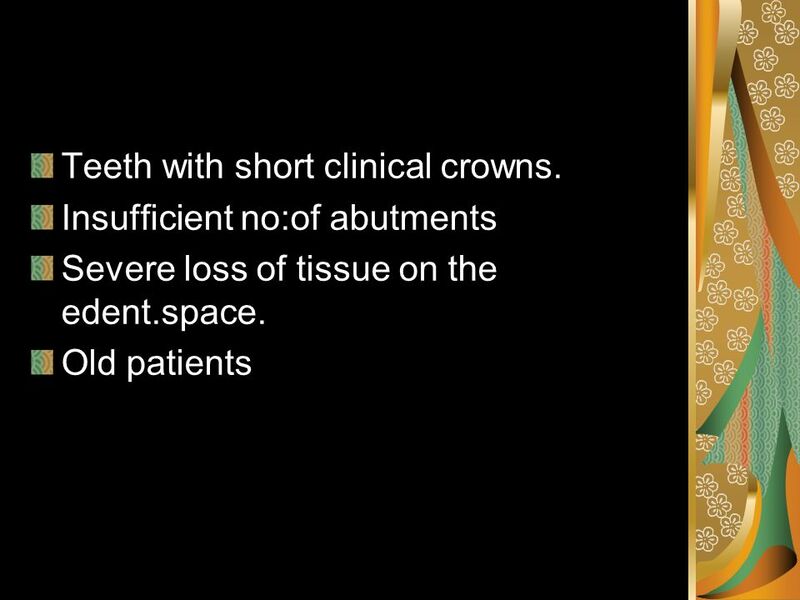 13 Teeth with short clinical crowns. 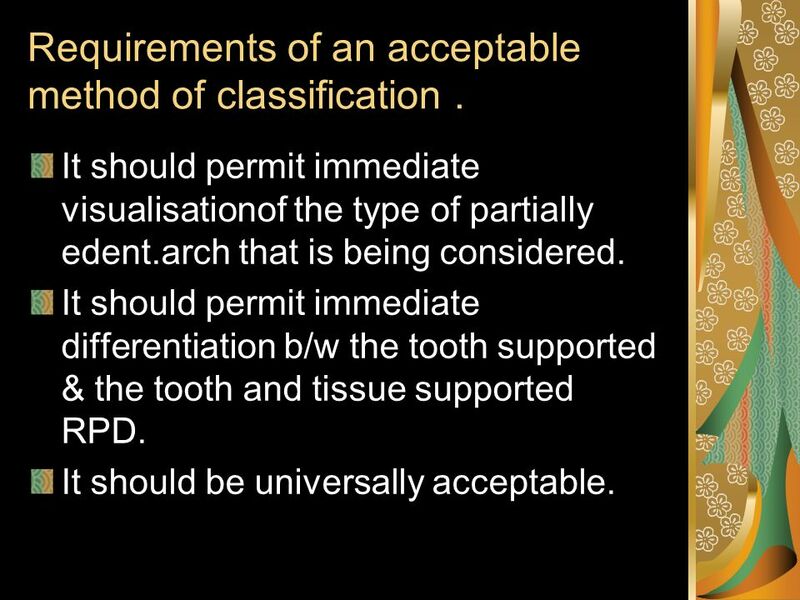 14 Requirements of an acceptable method of classification . It should permit immediate visualisationof the type of partially edent.arch that is being considered. It should permit immediate differentiation b/w the tooth supported & the tooth and tissue supported RPD. It should be universally acceptable. 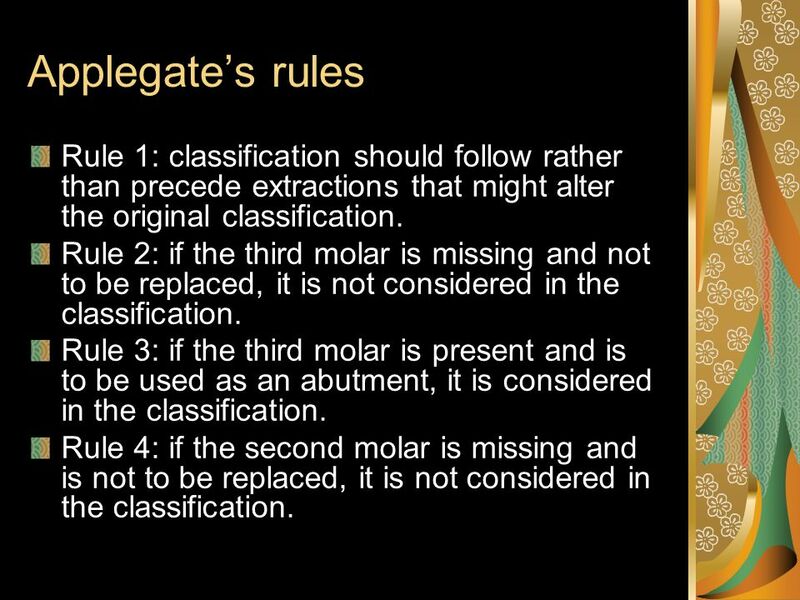 16 Applegate’s rules Rule 1: classification should follow rather than precede extractions that might alter the original classification. Rule 2: if the third molar is missing and not to be replaced, it is not considered in the classification. 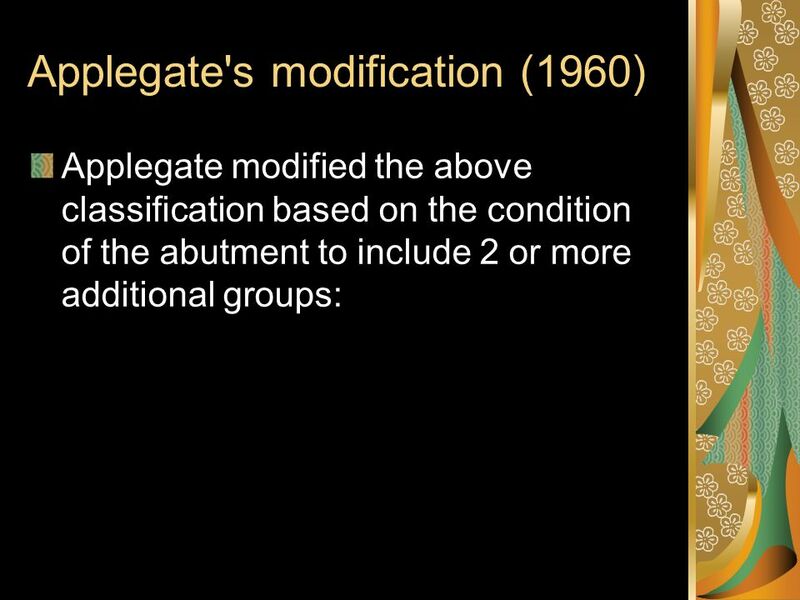 Rule 3: if the third molar is present and is to be used as an abutment, it is considered in the classification. 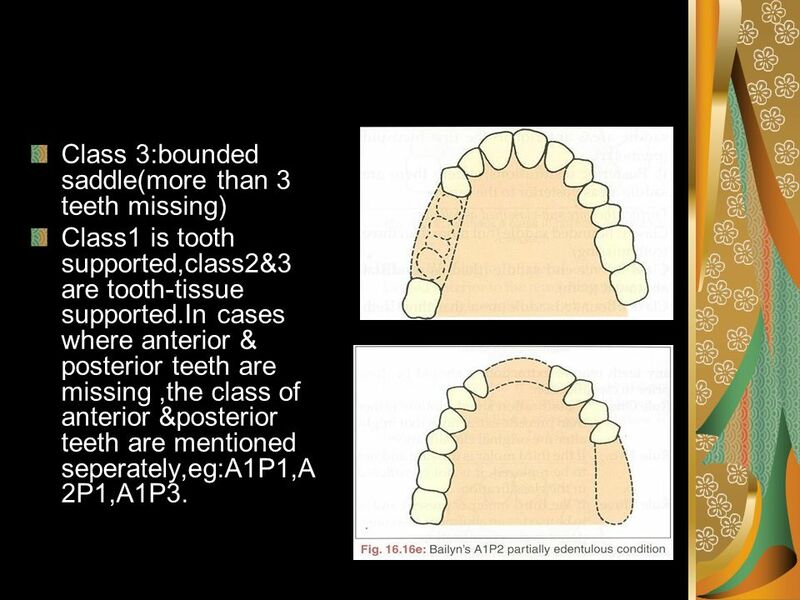 Rule 4: if the second molar is missing and is not to be replaced, it is not considered in the classification. 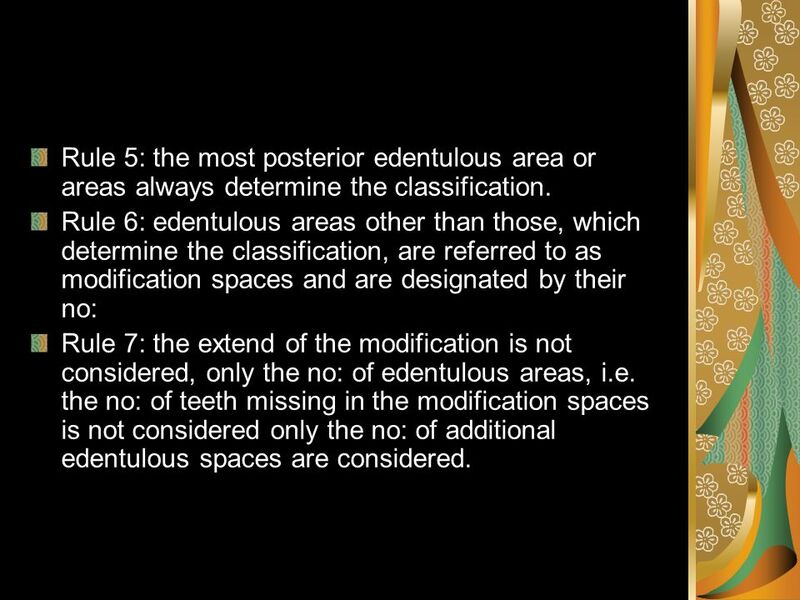 17 Rule 5: the most posterior edentulous area or areas always determine the classification. 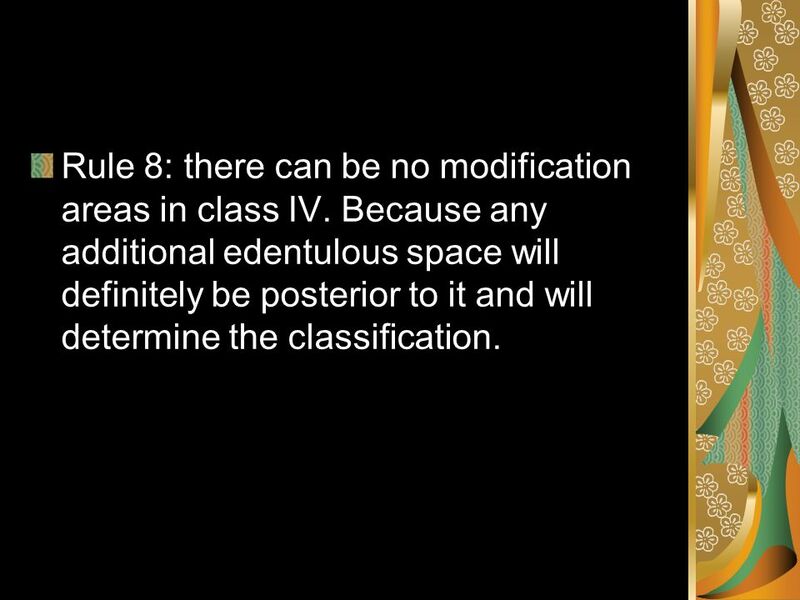 Rule 6: edentulous areas other than those, which determine the classification, are referred to as modification spaces and are designated by their no: Rule 7: the extend of the modification is not considered, only the no: of edentulous areas, i.e. 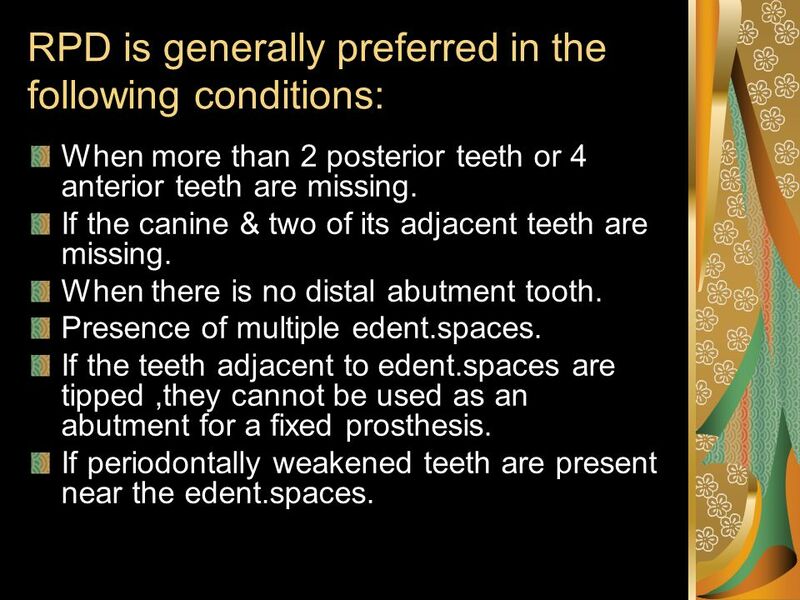 the no: of teeth missing in the modification spaces is not considered only the no: of additional edentulous spaces are considered. Rule 8: there can be no modification areas in class IV. 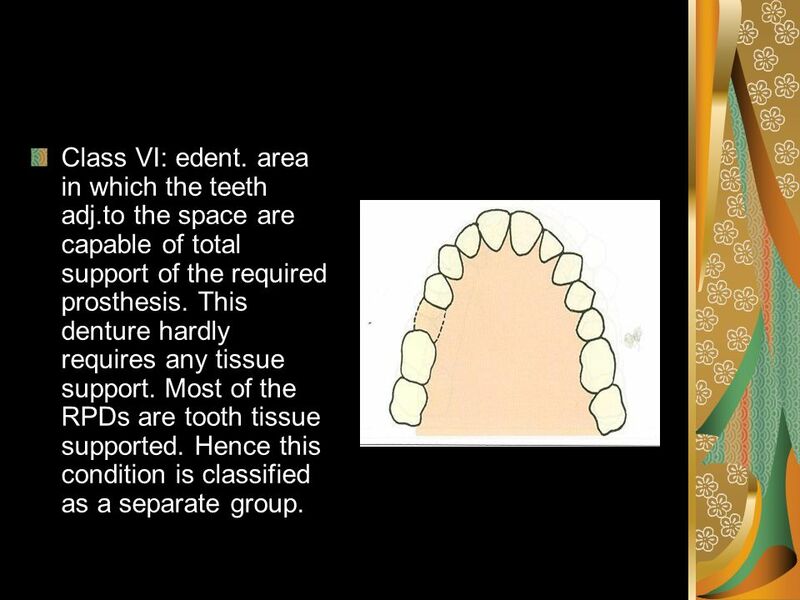 Because any additional edentulous space will definitely be posterior to it and will determine the classification. 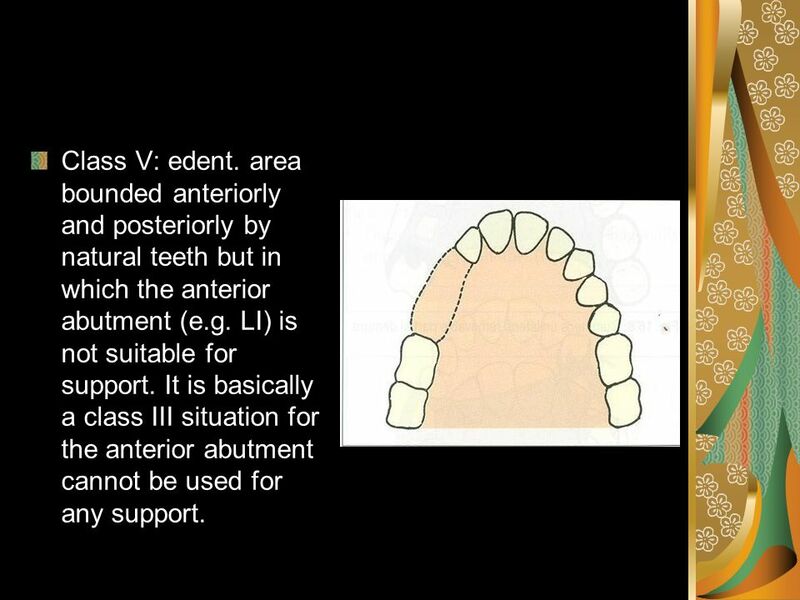 Class I: bilateral edentulous areas located posterior to the remaining natural teeth. 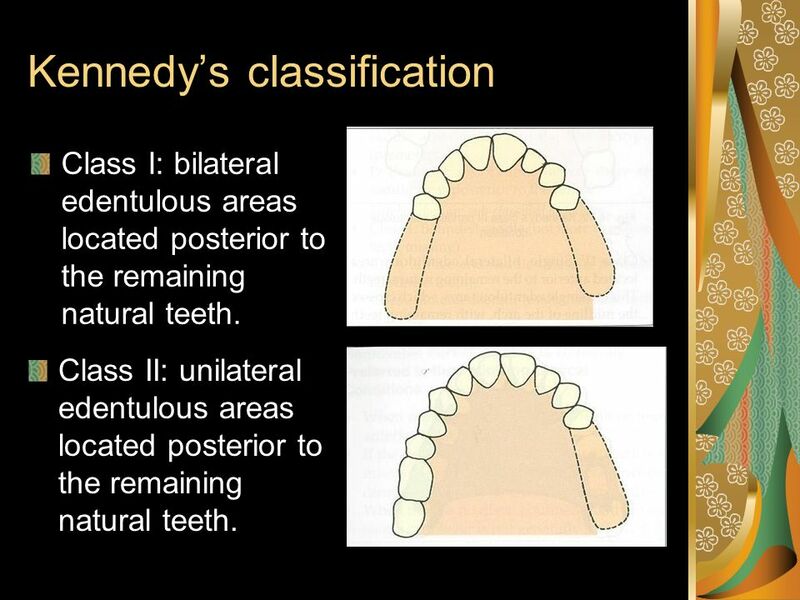 Class II: unilateral edentulous areas located posterior to the remaining natural teeth. 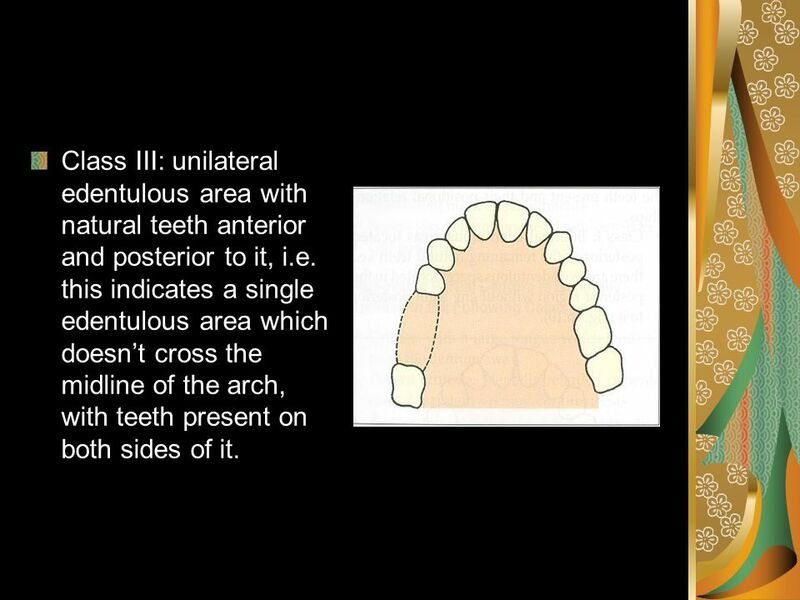 21 Class III: unilateral edentulous area with natural teeth anterior and posterior to it, i.e. this indicates a single edentulous area which doesn’t cross the midline of the arch, with teeth present on both sides of it. 22 Class IV: single, bilateral edentulous area located anterior to the remaining natural teeth. This is a single edent. area, which crosses the midline of the arch, with remaining teeth present only posterior to it. 24 Class V: edent. 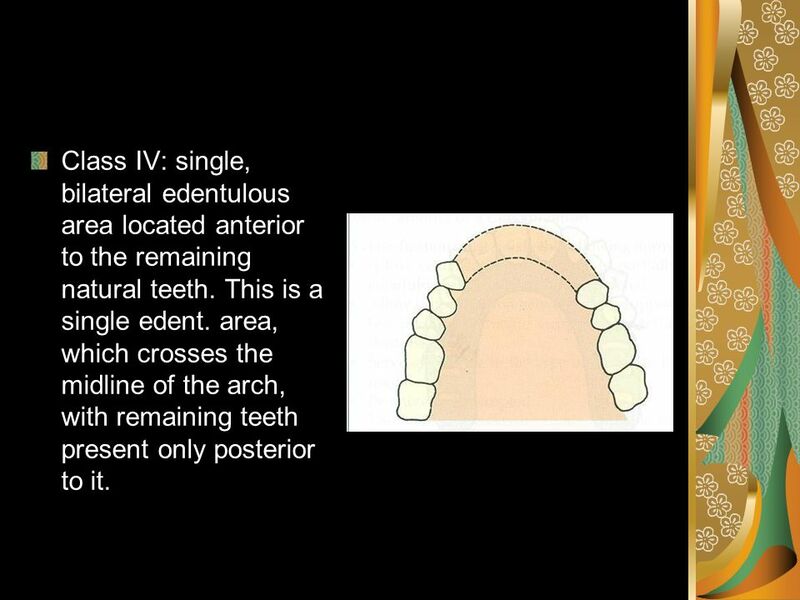 area bounded anteriorly and posteriorly by natural teeth but in which the anterior abutment (e.g. LI) is not suitable for support. It is basically a class III situation for the anterior abutment cannot be used for any support. Class VI: edent. area in which the teeth adj.to the space are capable of total support of the required prosthesis. This denture hardly requires any tissue support. Most of the RPDs are tooth tissue supported. Hence this condition is classified as a separate group. 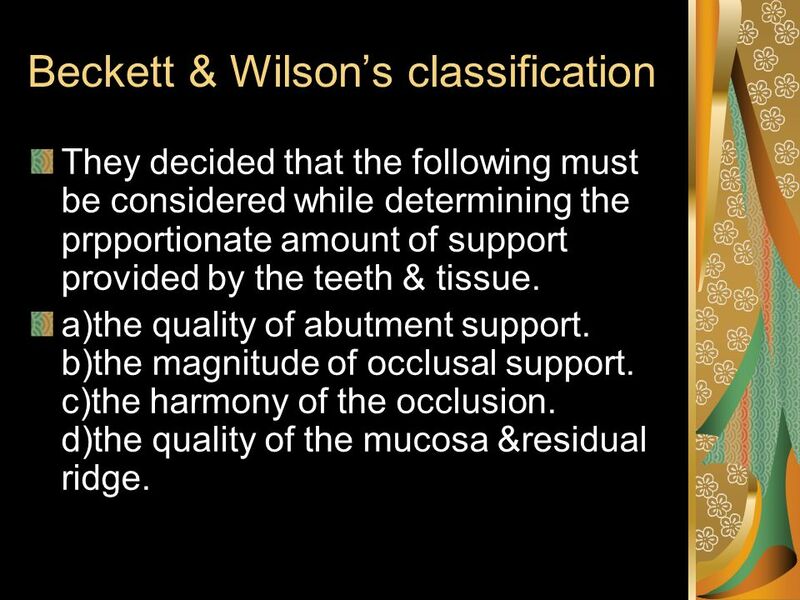 They decided that the following must be considered while determining the prpportionate amount of support provided by the teeth & tissue. a)the quality of abutment support b)the magnitude of occlusal support. c)the harmony of the occlusion d)the quality of the mucosa &residual ridge. 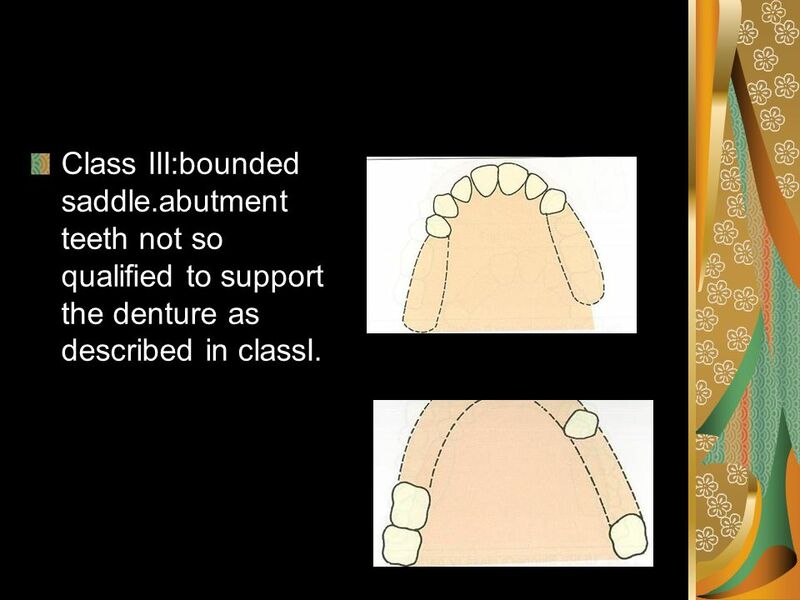 27 class I:bounded saddle.abutment teeth qualified to support the denture.mucosa is not used for support. 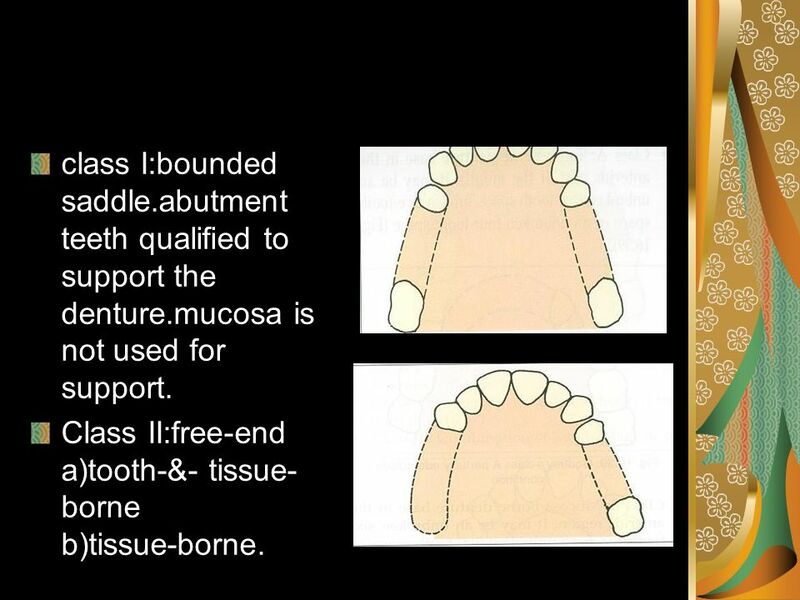 Class II:free-end a)tooth-&- tissue- borne b)tissue-borne. 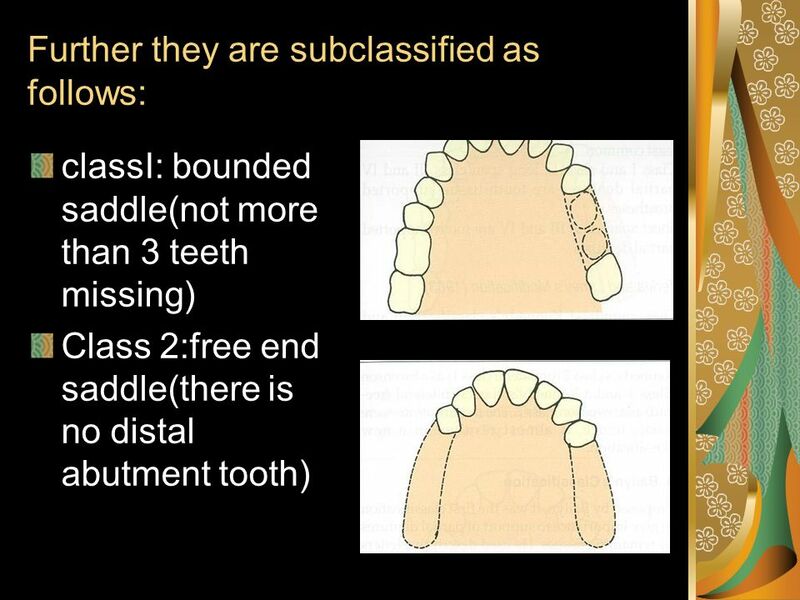 Class III:bounded saddle.abutment teeth not so qualified to support the denture as described in classI. 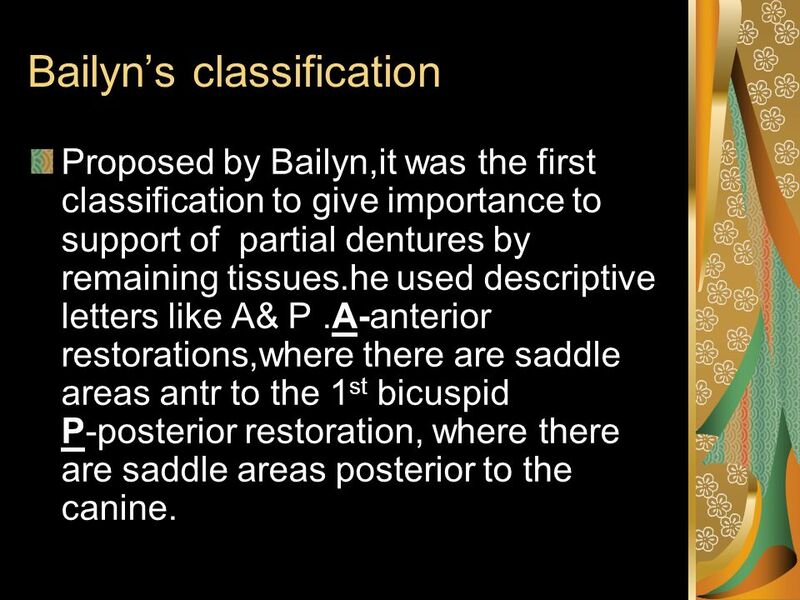 Proposed by Bailyn,it was the first classification to give importance to support of partial dentures by remaining tissues.he used descriptive letters like A& P .A-anterior restorations,where there are saddle areas antr to the 1st bicuspid P-posterior restoration, where there are saddle areas posterior to the canine. 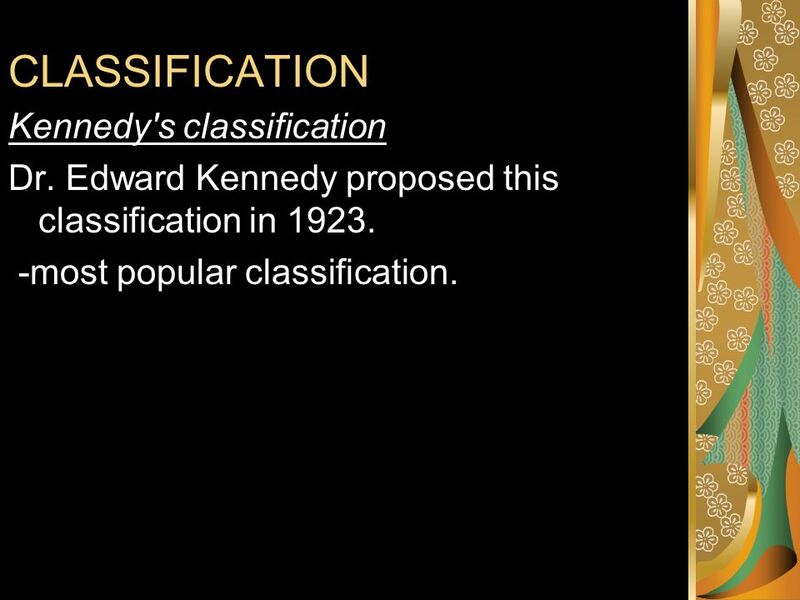 Class1 is tooth supported,class2&3 are tooth-tissue supported.In cases where anterior & posterior teeth are missing ,the class of anterior &posterior teeth are mentioned seperately,eg:A1P1,A2P1,A1P3. 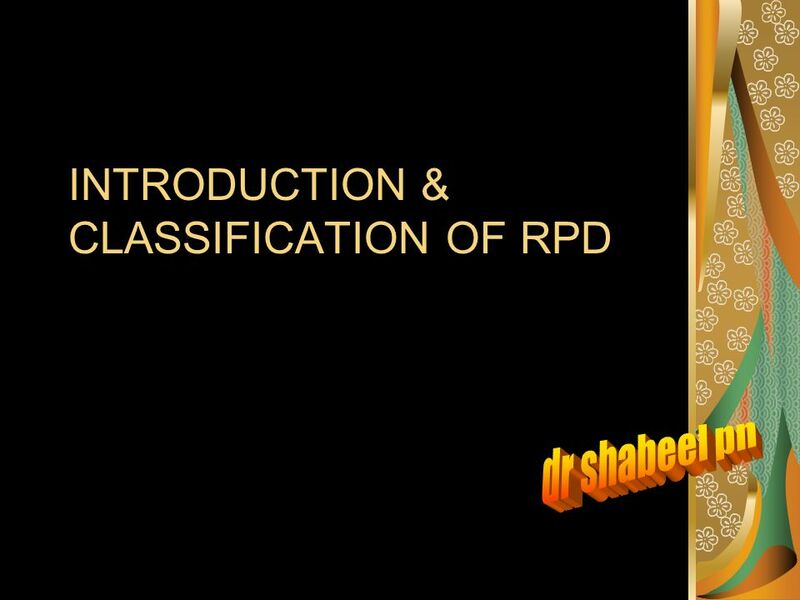 Download ppt "INTRODUCTION & CLASSIFICATION OF RPD"
Introduction:  Dental laboratory technology is the art and science of designing, manufacturing and customizing corrective devises and replacement for. DR. NORA SHETA ASSISTANT PROFESSORS PROSTHODONTIC.